We’ve recently had a new pavement laid down near our flat. It looked lovely and clean, for about half a day. 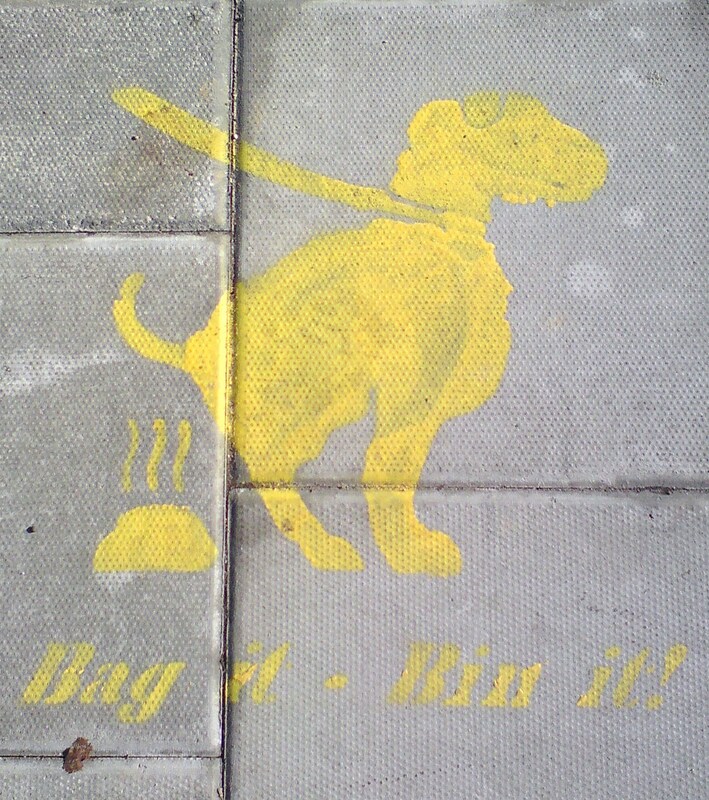 Then it began to get marred with dog poo, just like the old one. The local council obviously had a lightbulb moment when they stencilled the below image onto the pavement at regular intervals. Do they really envisage this having any, I mean any effect on the non-pooper-scoopers around here? It looks like a 5-year old painted it! And what’s with the atrocious font choice? I’m no typographer but I’d like to hear what one of my typographery-type (?) friends has to say about it! I really can’t see these poor excuses for stencils having much of a difference. In fact I’m tempted to go and paint polka dots on them one night but I’m too scared I might get arrested. Hold on, if I used chalk, which washes off, that would be ok, wouldn’t it? Watch this space…. Also I’m annoyed already with the darker nights and colder weather. I feel like I’ve been robbed of a summer that was promised but never even arrived. I’ve been stood up by summer. My flip flops didn’t even get a look-in. Still, look on the bright side, at least it isn’t raining. Much. However, even I have got something to be thankful for. Whilst out with a friend for dinner the other week, we toasted those commuters who have the daily grind to work on over-packed trains and tubes, allowing us lucky few to work at home, only having to bear the grunting, sweating masses on rare occasions when a meeting calls us into central London. We were surprised by the long queues stretching out of restaurants in London. On a Wednesday of all days! No sign of the credit crunch in the dining industry then, lucky things. Shortly after that I heard the great phrase ‘dead cat bounce’, which was first coined about 23 years ago. It basically means a small and temporary recovery in a financial market following a large fall, the idea being that even a dead cat will bounce if you drop it from a great height. Fantastic. Curious keyhole from my Photobox gallery. Click to see more. I lose my keys, I lose my phone, I miss the train, I get the wrong date. My first night in my new house (and a bit of thriftiness)! The Green Chain – PriceMinister’s Blogger Interview for the environment. £10 will be donated to charity if you answer the questions and publish them. A brief catch-up! I went to France, I bought a house and Big G is off for a month, exploring mountains. I’m trying my hand at mosaics! For free! !